Fantastic news for people who suffer regularly from migraine headaches. The FDA has just approved a wearable electrical stimulation device for sales in the United States — a headband that prevents the onset of migraines when worn for just 20 minutes each day. A device like this is definitely long overdue. Some 10% of people worldwide suffer from migraines, a condition characterized by intense pulsing or throbbing pain in one area of the head, accompanied by nausea or vomiting and sensitivity to light and sound. Developed by STX-Med in Beligum, Cefaly is a compact, portable, battery-powered, prescription device. It's placed at the center of the forehead, just above the eyes, using a self-adhesive electrode. 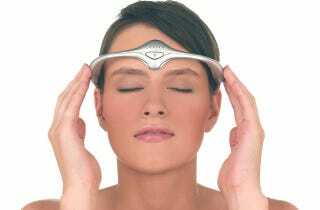 The headband then delivers transcutaneous electrical nerve stimulation (TENS) to the trigeminal nerve known to be involved in migraine headaches. The only known noticeable effect is a tingling or massaging sensation where the electrode is applied. It can only be used by people age 18 or older and should be used no more than once per day for 20 minutes. A recent study showed that people who use Cefaly experience significantly fewer days with migraines each month. They also rely less on medication. It's not effective in completely eliminating migraines, but 54% of patients were satisfied enough that they'd be willing to purchase the device.